Fundraiser by Jason Kapoor : Keep Tony Warm & Safe! Keep Tony Warm & Safe! me this is his 5th winter riding his bike to work. He does so because he can not afford a car due to the majority of his income going towards his ill wife. This gentlemans name is Tony. He is just a hard working man, trying to make a living to take care of his wife. Upon my Facebook post, a lot of people wanted to create a go fund me page for Tony to get a vehicle to keep safe and warm this winter! So here it is. All proceeds will go to purchasing the vehicle for Tony as well as insurance costs. Thank you! considering the amount Go Fund me will take for their services. Tony is overwhelmed by the amount of support all of you have given. It's nice to see good in the world still! You all are awesome! Tony will be in a vehicle soon with enough money to cover insurance, gas, and some extra to help care for his wife! Thanks again everybody! Happy Holidays! We did it! 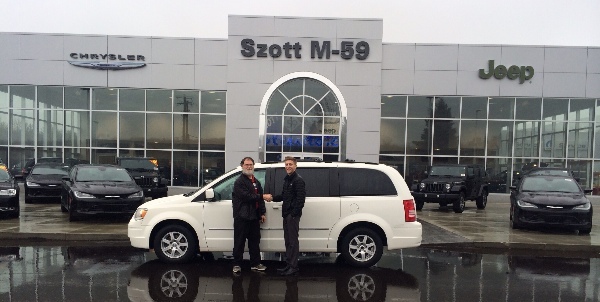 Tony is now the new owner of a Chrysler Town & Country! Thank you so much everybody! None of this would have been possible without all of you! Sunday we will no longer be accepting donations. Tony is extremely grateful for all of this. He also wants to simply say thank you. You've changed his life. You all are great! Hello everybody! This is Jason. I just wanted to say thank you to everybody who donated and shared! It truly is amazing how powerful we all can be when we come together! Tony is overwhelmed with joy! He is at a loss for words when I speak with him and update him. He is extremely grateful for all of this and all of you! As well as I! Tony will be purchasing a car on Friday! Have a wonderful Thanksgiving everyone! Tony is exploring the possibility of this Chrysler Town & Country! Thank you to all of you who are donating and/or praying...Tony is a good person who just needed a hand up and never asked for a hand out. He is super smart but sometimes circumstances can get people down...thank you for helping my brother turn it all around!! wow some of these comments are down right rude. I am sure, since this mans money goes to his wife's medical bills and her constant care - he will buy a dependable car and then some will go to his wife. Sure it's ok to question but to say what makes him better than the rest of us? How about the fact that everything goes to his sick wife and he has nothing. That says it all! Plus if you read some of the donation posts, people who know him personally are speaking for him as well. No Joe may not know all of his personal info but he sure knows how to find him & maybe he wants to surprise him with this money. Don't put this guy down. If you don't agree MOVE ON!! No one is making you donate. I sure hope he doesn't see your negative posts! Sure glad I don't know some of you grinches! I too have a family of 6 to support but I like MOST people don't look at this as "what makes him so special than the rest of us supporting a family" I am choosing this man as my Christmas donation this year. God bless you Tony & wife and Joe too! This is wonderful of you! I want to thank all of you who have given!! I want you all to know I am not a fraud as what some are saying about me. It is being spoken about me that I was given 3 vehicles and didn't maintain them. The first vehicle was actually given back to my sister's daughter, and I was biking again. The second was again provided by this same sister, and it was a 1994 van with about 170,000 miles on it. After about 6 weeks, the transmission went out on it. Twenty one year old vehicles are not expected to last that long, and this one's time had come. I was back to biking. My dad stepped up with the third vehicle. It was a 1997 Ford van with 188,000 miles on it. Some kind of oil rupture happened to the engine after only a few weeks. The oil was just changed prior to me getting the vehicle, so I didn't break that one either. 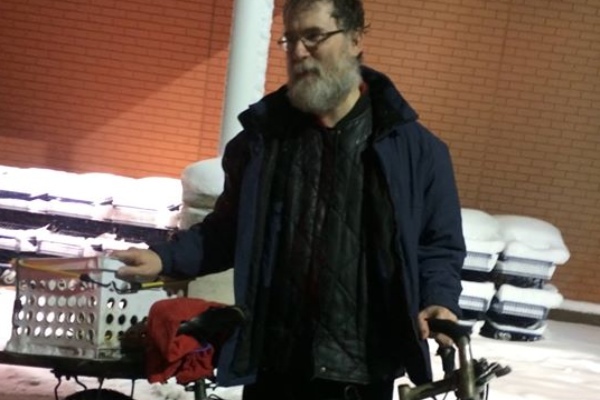 So, I was biking again when that terrible snow storm hit when Jason picked me up. Thank you Jason!! Couldnt find other go fund mes for this man... Shame on u ppl for getting all bent outta shape .. If you actually did find other pages ...why havent u provided proof? Ill share.. To get the word out to help this man...god bless u jason and tony! This is just a thought....but does Tony want & need a vehicle worth $15k? My husband doesn't even drive one worth that. Maybe a $5-$7k vehicle and the rest to help him pay off the medical bills? I'd love to help if I know this would go toward a cheaper car AND medical bills. Great job Jason stepping up and helping a complete stranger. All the negative Nancy's on here need to chill. Can't people see the good in things or must you always cast shadows on others good fortunes. Im absolutely appalled with the comments of what has to be the most miserable people on earth....just because God decided to bless this young man folk want to come on here and use his platform to promote your struggle while at the same time throwing shade! Maybe thats why your not blessed !! Learn to celebrate others and just maybe God's favor will shine upon you.... from the one trying to say he is a fraud to the miss im a single mother struggling! Get a life!! Jason works for a local dealership. The owner of the dealership himself donated money on here. This is a legitimate gofundme. Please don't try and make a good thing out to be a negative. Ive shared this on multiple mom2mom and garage sale sites! Fingers crossed! This is so wonderful...happy holidays!! I can't get on the computer everyday, and sometimes it might be several days. But, I see the recent activity. Yes, I got the car!! So, you won't be seeing me anymore on M-59 on my bike. Currently, I have it in the van in case I run out of gas or something. There is a guy at my job at Meijer who lives farther away than I do from it, and he also bikes everyday. He does not bike on the side of the road, though, like I do. Instead, he bikes on the sidewalks and shoulders. In the winter, though, when the snow is plowed onto the sidewalks, Bill is forced to walk to work. Bill and I are in different departments and shifts. Jason told me some of the people wanted to donate their car to me, and he is going to try to hook Bill up with one of those. Jason is a great guy!! Jason- true kindness!! Those doubting- there are many of us who can vouch for this story. We've been watching Tony ride for a while and it's fantastic Jason stepped up and got the ball rolling with a ride. This has been picked up by the news on Channel 7 (wxyz) and on Fox 2. Man, I wish it was that easy for someone to start a gofundme all because I don't have a car. I walk to work also. Single mother also. Barely get paid anything. Smh. Let's hope he actually gets the money and uses it for a car since I've been hearing and seeing that this guy has another gofundme and is a fraud. There's other people out there that walk to work also. What makes him more special than the rest of us that are trying to provide for our family? I hope you get a car really soon- please know that we are all here for you! Be safe. God bless you. I am in awe of you!! I am strapped financially, however I did share this with my friends. GOD bless you and your family! The grace and caring of this 20 year old took our breath away. Godspeed all. Good luck Tony. Glad to see you are going to be safe this winter. Have a Happy Holiday Season, Tony! Best wishes to you and your family. Merry Christmas!